Canada's Cynthia Phaneuf switched to golden figure skating blades for the 2003-2004 season and it proved to be good luck for her. Canada’s Cynthia Phaneuf switched to golden blades for the 2003-2004 season and it proved to be good luck for her. She was a surprise winner of the Canadian senior ladies championship in Edmonton last season, following up with a silver medal at her first major ISU international, the 2004 Four Continents Championships in Hamilton, Ontario. Phaneuf jumped from eighth in the short to win the free skate. The 16-year-old has progressed rapidly through the ranks in Canada, never remaining more than a year in any division before reaching seniors. She was the juvenile ladies gold medallist in 1999, the pre-novice champion in 2000, sixth in novice in 2001, and second in juniors in 2002 before her debut in seventh place in seniors in 2003. Internationally, she won the ISU Junior Grand Prix at The Hague and the Mladost Trophy in Zagreb in 2001. She also took the bronze medal at the ISU Junior Grand Prix in Montreal in 2002 and the Sofia Cup in 2003. Although she was eligible to compete at the 2004 World Championships, Phaneuf chose to compete at the Junior Worlds instead. “My goal for last season was to go to the World Junior Figure Skating Championships,” she stated. “The previous year I wanted to go but didn’t. I wasn’t ready then, but last year I was. I want to take things one step at a time. I had never been to a world championships before so it was better to do the Juniors for the first time. I was just happy to be there and just wanted to do what I do in practice.” She finished tenth overall. “My goal for this season is to win the Canadian championship,” she said. “It was a big surprise for me to win Canadians last year. I plan to compete for a long time, probably until at least 2010. I want to do shows but I want to win something big first.” For the 2004-2005 season, Phaneuf is currently slated to compete at Skate America and Skate Canada. The talented brunette trains in Drummondville, Quebec with Annie Barabe and Sophie Richard. She practices for about two to two and a half hours five days a week, then does six hours of off ice work. “I used to play baseball and do ballet and dance, but now I mainly just do stretching,” she said. “I do about 30 minutes before and after my practices and on the weekends I have a coach who helps me at home with my stretching.” Phaneuf does compete run-throughs of each of her programs every day. David Wilson choreographs her programs. “Annie and I choose the music for my programs,” she noted. “Both of my programs were new for last season. Annie listened to the CDs and found the music and asked if I wanted to have it and I liked it.” Last season, Phaneuf skated to The Promise by Rolf Lovland performed by Secret Garden for the short, Quelques Jeux Interdits for the long, and I’m With You by Avril Lavigne for her exhibition program. Off ice, she listens to everything but prefers rock and R&B. Phaneuf’s favorite subject in school is English, although her native language is French. “I’m a good student, but I could be better,” she said. “I missed two months of school last year for skating.” She plans to go to university and become a lawyer. “I don’t know if I will have time for both skating and school, but I will go to the university,” she said. 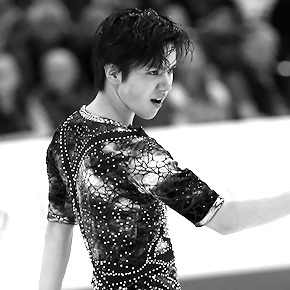 Japan’s Shoma Uno is the first skater to successfully land a quadruple flip in an international competition at the 2016 KOSÉ Team Challenge Cup event at Spokane Arena in Spokane, Wash. More on Shoma Uno in the GS Forum.